Diodes Incorporated announced the DGD2136. This fully integrated 3-phase gate driver IC is intended for driving N-channel MOSFETs or IGBTs in a half-bridge configuration. With its floating high-side drivers, bootstrap operation allows the DGD2136 to switch up to 600 V, while standard logic level inputs down to 2.4 V enable an easy control interface. This gate driver is designed for BLDC and PMSM motor drive applications such as those commonly found in household appliances, power and garden tools, air conditioners, sewing machines, and industrial motors. The increased use of BLDC and PMSM motors reflects industry directives to improve the efficiency of electrical motors and achieve the goal of zero maintenance in order to minimize the total cost of ownership. 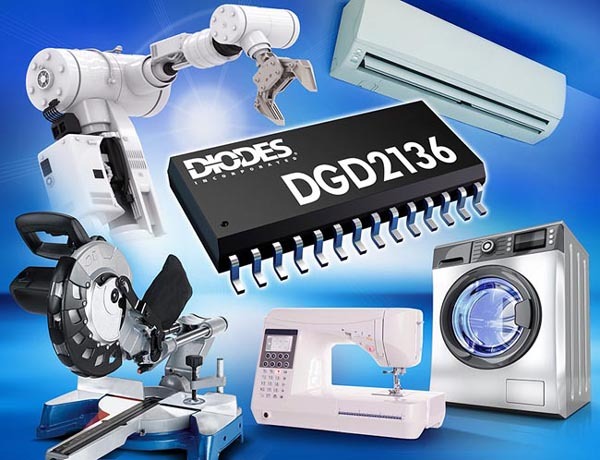 To meet this requirement, the DGD2136 is optimized for 3-phase applications, driving three half-bridges formed from N-channel MOSFETs or IGBTs. A high voltage process enables the floating high-side drivers to operate up to 600 V while the driver outputs feature high-pulse current buffers to minimize driver cross conduction. The device incorporates multiple protections: overcurrent is sensed via an external resistor to turn off all outputs; matched propagation delays with an internal deadtime and shoot-through logic prevent both outputs from being high when both inputs are high (a fault state); a VCC undervoltage lockout shuts down the respective high side output; and built-in immunity to high dv/dt transients at the VS pin minimizes the risk of false triggering. The DGD2136 also has a fault signal output that enables monitoring of the driver stage and can be used with the RC input pin to provide an adjustable reset time. The DGD2136 gate driver is offered in an industry-standard SO-28 package.